Wednesday evening marked the eleventh edition of Kansas City's monthly Rap Asylum series at Westport Coffee House. Organized by Sauce, Kartez Marcel, Duncan Burnett, and friends, the shows feature an open mic portion, guest spots, a beat set, and a headlining rap set. 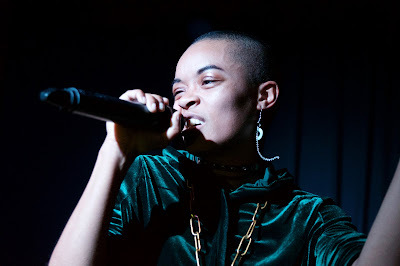 January's gig was headlined by Yanna -- a young rapper fusing queer culture and hip-hop and creating some of the most skeletal, yet infectious music in the scene. Renditions of her songs "Supa Flowa" and "Zoomin'" exploded in the small theater setting and her word-of-mouth buzz hit another peak. Her friendly presence and banter felt right at home among a room full of community-minded artists and musicians. The evening's beat set came courtesy of Dom Chronicles, who also performed a couple full tracks earlier in the evening. Open mic slots, DJ sets from Burnett, and guest sets from Sauce and Marcel preceded this.